We need a new financial system that is accountable for its effects on people and the planet. I believe that impact investing presents a real alternative to the status quo….. 3 priorities for impact investments: mobilize more capital, ensure impact integrity and build the movement…..I hope that every one of you views this movement not just as an opportunity but as a responsibility to lead, to change expectations, & to build a just and sustainable world where everyone uses the full power of their investment capital as a force for good! As the movement grows and starts mainstreaming there are different forces at play. As my colleague quite cleverly pointed out, there are a few camps looking at impact investment from different perspectives: impact fundamentalists, risk mitigators and impact washers. 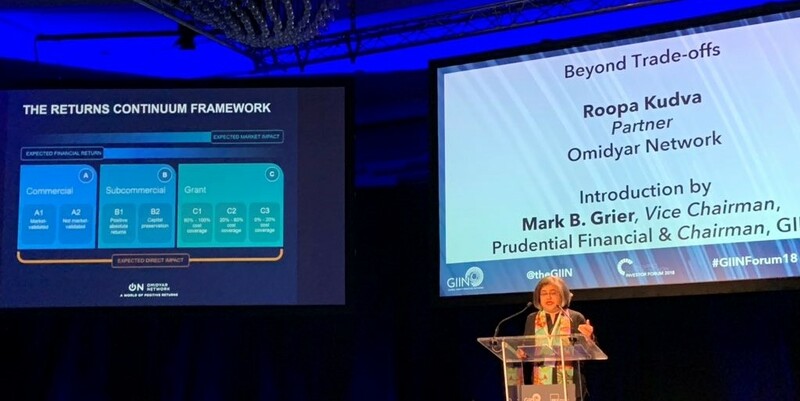 Thanks to GIIN members, and the thought leaders like Jed Emerson and Sir Roland Cohen there is a strong push to ensure impact integrity. 1) we should start seeing by 2020 the equivalent of impact accounts under GAAP (Generally Accepted Accounting Principles) so that companies can publish alongside their financial accounts their impact financial accounts and 2) Measurable means dependable, not 100% accountable… if 20% of companies measure their impact, that’s a paradigm shift and the rest will follow. “We need to have a conversation about what value we really want to create. We will stay where we are if we just stay focused on making money with money.” were strong words by Jed Emerson who has recently published “The Purpose of Capital” (the book is free to download! ), a very important literature that reminds us to stop and reflect as we are thinking and talking too much about the “how” and getting blurred on the “why”. Omydiar Network presented the outstanding series “Beyond Trade-offs” covering perspectives of leading investors who have moved beyond the trade-off debate to invest across the returns continuum. A topic which is appearing more is the role of Blockchain in impact. There were two presentations both moderated by Shaun Conway, President of ixoFoundation. ixo is building the Blockchain for Impact, transforming all measurable changes that have an impact into Verified Impact Data with crypto-economic Proof of Impact. A lot of exciting learnings to come from this area! ixo: The Blockchain for Impact from ixo foundation on Vimeo. This entry was posted in conference/symposium, education, impact investments, innovative partnerships, SDGs, sustainable investments on November 9, 2018 by microfinance.